We like all beef weenies but you can make your mini barbecue weenies with any little weenie you happen to have. Below are a couple versions we like. Although most of these recipes do not actually require you to BBQ or light a grill they are really good and typically get a great response from guests. From simple and fast to preparations you may want to make the day before. Either way Mini BBQ Weenies are a crowd pleaser for old and young alike. Mini BBQ Weenies with BBQ Sauce, Yum! You can use your favorite store bought BBQ sauce for your weenies or make some home-made BBQ sauce (click here for our recipe). 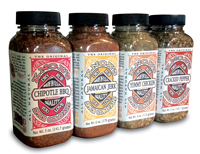 Tangy BBQ sauces seem to work best, with a touch of smoke for an authentic BBQ flavor. Heat BBQ sauce in a pan big enough to hold the sauce and the weenies. Once warm, toss in the weenies and heat through. Serve on toothpicks. We like these a couple ways and it all depends on the jelly and hot sauce you want to use. This recipe with orange marmalade and Tabasco can be almost Asian in flavoring. For a milder flavor you can substitute hot sauce with a cocktail sauce or even a chili sauce. 1 or so Tablespoons hot sauce depending on how hot you like it. Use your favorite. In a sauce pan big enough to hold the sauce and mini BBQ weenies, mix together jelly and hot sauce. Stir until jelly is melted and the sauce is heated through. Toss in the mini weenies and toss to coat. Heat through and serve with tooth picks. Here is one where you get to light the grill, WOO HOO!. You can use mini weenies or hot dogs, red hots or mets cut into small portions after cooking. This recipe is our personal favorite as it includes the ingredients we like best; BBQ, bourbon and.........well that was enough for us. The flavors of the smoke from the grill and the bourbon, maple syrup and orange juice make for a delicious blend for mini weenies, that's for sure. In a sauce pan over medium heat put in the butter and heat through until melted. Add onion and sauté until clear or light brown. Add remainder of sauce ingredients and heat through until just beginning to bubble. Fire up the grill! Lightly grill mini BBQ weenies, hot dogs, red hots or mets. Once done chop into small bite size portions and place in bowl. Pour enough sauce to coat and toss. Serve with tooth picks. Well that's what we have for mini BBQ weenies although the sky is the limit when preparing this for guests. From buying a sauce to preparing your own. From simple toothpicks to serving on the end of long wood skewers and having the sauce on the side. It's your party, do what you like. Most people are just happy to be fed.